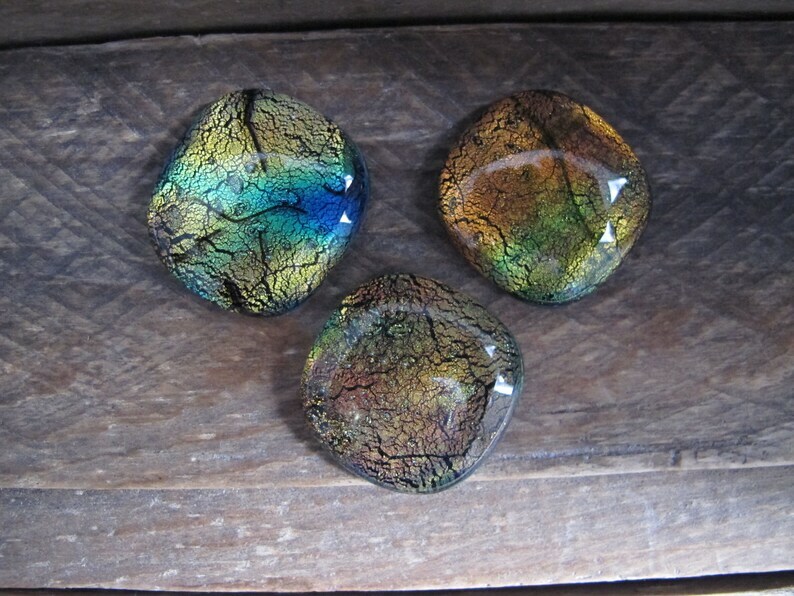 Three reptilian look free-form, handmade Dichroic glass cabochons, for Jewellery making, Stained glass, mosaics, bead work, etc. All three cabochons have a pretty shimmery reptilian look. One copper/light green cabochon has a green accents and is fused on a opaque black base. It measures approximately 31mm x 29mm. The next gold/blue/green cabochon, accented with green glass, is fused on a black base. It measures approximately 31mm x 31mm. The last peacock blue/green/gold cabochon is accented with green specialty glass, and is fused onto a black base. It measures approximately 30mm x 33mm. They are best suited for custom bezel cups and settings, wire wrapping and wrapping with copper foil, etc.